Winter months are perfect for some extra skin pampering and invigorating of the senses with a nice relaxing body scrub such as Tree Hut Shea Sugar Scrub Almond & Honey. Body exfoliation in Winter can really be part of a spa like experience that will give you all the time you need to relax and get that silky soft skin that makes you feel happy. Why to Choose the Tree Hut Shea Sugar Scrub? This is a good quality body scrub from a reputable company and contains some natural and organic ingredients such as organic Shea Butter, sweet almond oil, safflower seed oil, evening primrose oil, avocado oil, macadamia oil and orange oil. Shea butter is good for moisturizing as well as skin softening and soothing purposes while sweet almond oil is a great moisturizing and healing oil for healthy skin. Avocado oil nourishes and deep conditions skin while macadamia oil has rich moisturizing and nourishing properties. Although I could not find the full list of ingredients to have a full idea of the product, the above are all great natural components. This is an intense exfoliating scrub with a sweet rich scent of honey and almond. The real sugar grains and almond bits will get rid of dead skin cells gently revealing a smoother and softer skin. Its natural oils hold moisturizing and skin repairing properties that will help your skin look and feel more elastic and vibrant. The Tree Hut Shea Sugar Scrubs look quite attractive in their jar like white plastic containers and offer you various versions apart from the honey almond one such as coconut and lime, Hawaiian Kukui, Amazon Pequi, Himalayan Salt Scrub, Mediterranean Salt Scrub, Vanilla Spice and probably a lot more which seem to always keep you interested. The fact that this scrub exfoliates due to the sugar grains (and the almond bits) it contains which are uneven and can be harsh for the skin makes it, in my view, unsuitable for use on the face, so I would not recommend it for this skin area although there are some people who use it on their face as well. Still, the sugar grains and the bits of almond make a much more healthy exfoliating option compared to those plastic beads that have recently been banned in the USA. Since I could not find the full list of ingredients, I can’t really recommend it in case you have sensitive skin or suffer from any skin problems such as eczema, dermatitis and others. People are really fond of this scrub, saying that it feels like heaven to their skin since it makes it really soft and smooth, exfoliating it gently and effectively. Also, you don’t need to over scrub because the product dissolves fast enough. It smells soothing and it does not feel greasy. A few users with dry and tan lined skin found it very useful. While most people love its scent, few others find it too sweet for their taste and choose to use other Tree Hut scrub versions which find more attractive. Also, some people feel their skin moisturized after using it while others say that it does not make any difference to moisturizing their body but it definitely does when it comes to getting a silky soft and smooth skin. In addition, people like the 3 pack offer which is quite affordable. 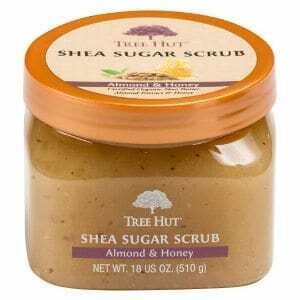 The Tree Hut Shea Sugar Scrub Almond & Honey is a good quality natural scrub to use if you want to keep away from plastic beads and go for a healthier body exfoliator that will make your skin soft and smooth and offer you a hint of a spa like skin experience.